During an MRI scan, you lie on a flat bed that's moved into the scanner. Depending on the part of your body being scanned, you'll be moved into the scanner either head first or feet first. The MRI scanner is operated by a radiographer, who is trained in carrying out imaging investigations. They control the scanner using a computer, which is in a different room, to keep it away from the magnetic field generated by the scanner. You'll be able to talk to the radiographer through an intercom and they'll be able to see you on a television monitor throughout the scan. You'll be given earplugs or headphones to wear. It's very important to keep as still as possible during your MRI scan. 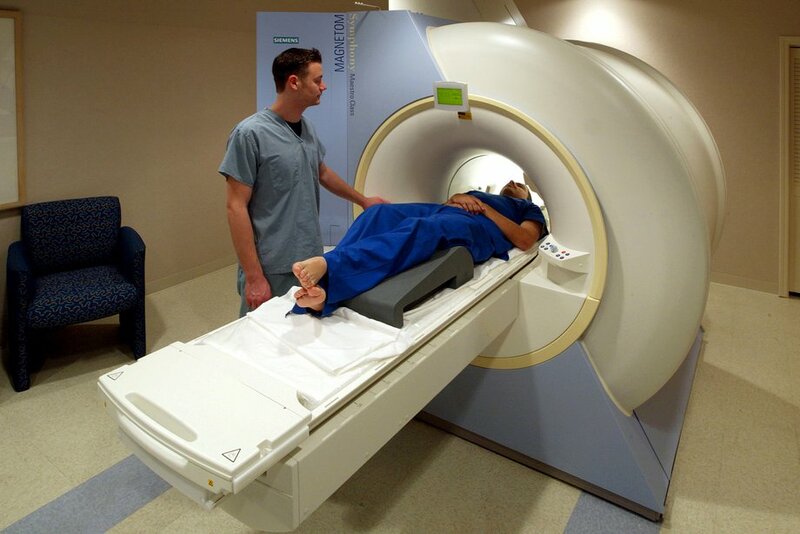 Read more about how an MRI scan is performed. At the centre of each hydrogen atom is an even smaller particle called a proton. Protons are like tiny magnets and are very sensitive to magnetic fields. Going into the scanner feet first may be easier, although this isn't always possible. No evidence has been found to suggest there's a risk, which means MRI scans are one of the safest medical procedures available. They're also not usually recommended during pregnancy. Read more about who can and can't have an MRI scan.